Create your private labeled mobile real estate website automatically populated with your RealBird listings, property search and blog posts. With home buyers spending increasing amount of time online using their smartphones and tablets, you have to provide mobile optimized real estate information for them. With the RealBird Mobile Real Estate Website, you can have a mobile presence in minutes, ready to showcase your featured listings, blog posts, and mobile property search. Add your mobile website to your Facebook Real Estate Page or your main website with the embed code provided. Your website works in desktop browsers too ! You can reserve your own city domain name for your RealBird Mobile Website and use it in print advertising to extend your marketing and to provide easy mobile access for your clients. 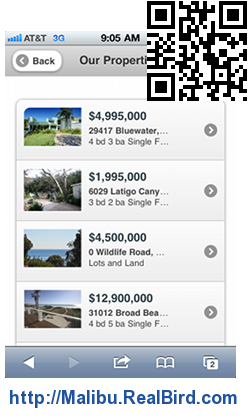 The mobile site comes with its own QR code and after you configured your RealBird Text Messaging platform a dedicated SMS code - "M" - is also assigned to your mobile real estate website. 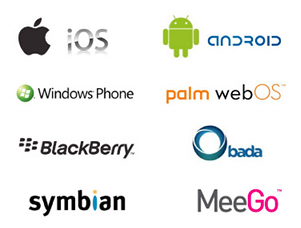 Sign up to RealBird PRO and create your mobile real estate website in minutes.